If approved by Congress, the agreement would defer the threat of a partial government shutdown and a default on the country’s debt until Dec. 15 and dispatch the first $7.85 billion installment of Harvey relief. So Trump's Democratic skirt is showing and this $7.85 billion Harvey relief "first installment" is moving along through Congress as though the entire world accepts the view that government should finance disaster recovery. This is not how you shrink government. I hope the libertarians who supported Trump now realize they have elected a president who has more in common with FDR than any other president. 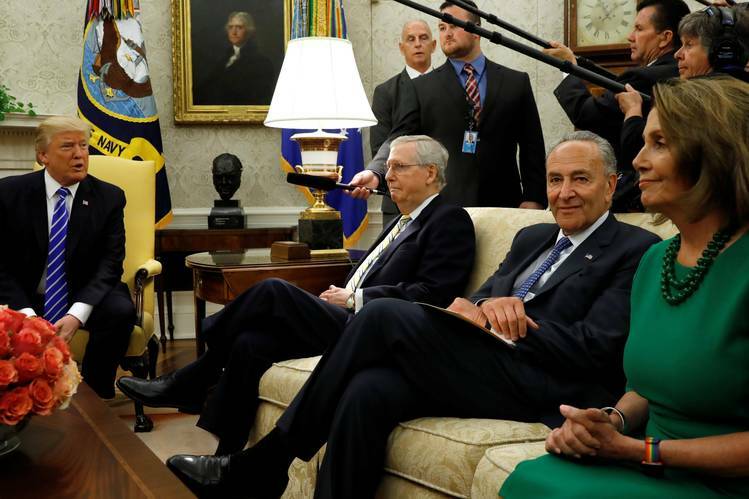 I never again want to hear someone ask why the Democrats chose Nancy Pelosi and Chuck Schumer as their leaders. The two just made a deal with the guy who wrote "The Art of the Deal" and made it the Art of the Steal. Poor President Donald Trump was lucky he got out of the room with his hair. On Wednesday, Trump threw his support to a deal that gave the Democratic leaders everything they wanted: disaster relief funding and a 90-day extension of both the day-to-day funding of the government and the debt ceiling. That means when the dual deadline for the budget and debt arrives in mid-December, Democrats will have enormous leverage. They will be in a position to trade support for the budget and the debt ceiling for any number of Democratic priorities, from health care to protection of Dreamers who are suddenly facing deportation. Senate Majority Leader Mitch McConnell and Speaker Paul Ryan were left fuming, the rug having been yanked out from under them by the leader of their own party. The only difference between Trump and Hillary is that the resistance to Hillary's policies would have been massive. Trump has co-opted the resistance that would want smaller government. His only resistance comes from the Left that wants even more socialism. I really hope more libertarians start speaking out against Trump. There is zero strategic advantage in supporting him. Zero. "blow-by-blow" is at least the perfect description. BTW, your blog posts would be stronger if you left out the constant "libertarians supporting Trump" red herrings. Of all the problems libertarians have -- too numerous to even try to list -- the ones supporting Trump were long lost in the noise. The "libertarians supporting Trump" (I was never one of them just to be clear) meme is really getting old -- literally to the point of making me want to stop reading here. I read a post with a great point that winds up at the end with me rolling my eyes, which undoes your other great points. It is problematic that Robert gives libertarians so little credit that he would assume we didnt know this whole presidency - like every presidency - is a ruse to distract the masses with meaningless minutia! Trump tows the line of the unelected power brokers like all the elected do. Apparently Wenzel doesn't know that the feckless wonder Gary Johnson was the actual Libertarian candidate in 2016.